The group is calling itself the Islamic State of Iraq and al Sham, translated as the Islamic State of Iraq and Greater Syria, or ISIS. And so it may come to be. A militant Islamist group that has carved out control of a swath of Syria has moved into Iraq, conquering cities and threatening the Iraqi government the U.S. helped create and support with billions of dollars in aid and thousands of American lives. The group– known as the Islamic State of Iraq and al Sham– isn’t a threat only to Iraq and Syria. It seeks to impose its vision of a single radical Islamist state stretching from the Mediterranean coast of Syria through modern Iraq, the region of the Islamic Caliphates established in the seventh and eighth centuries. Kurdish Peshmerga forces in the northeast claimed separately to have taken control of Kirkuk, center for the key oil fields in northern Iraq, and roughly dividing up the country along sectarian lines between the Kurds, Sunni, and Shia. Let’s start with the immediate implications for Iraq’s oil production. Not too long ago, Iraq was claiming that it would be producing 12 mb/d by 2017. To describe those plans as “ambitious” seems too gentle a criticism. Gross overstatement of what was feasible was a necessary consequence of a bidding procedure in which awards were based on the daily volume that a company promised to produce. Nevertheless, some analysts like Leonardo Maugeri took Iraq’s claims half-seriously (literally), assuming that Iraq would be able to achieve half of those target levels by 2020. 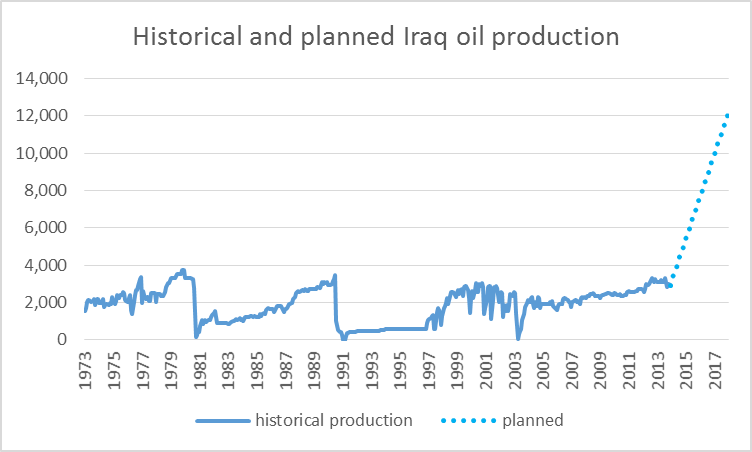 Historical Iraqi oil production in thousands of barrels per day, 1973:M1 – 2013:M12, and linear extrapolation to goal of 12 mb/d by end of 2017. All the oil companies are on alert… They are going to worry about the security of their people and installations. Obviously, no one is going to do anything new. Four years ago, Stuart Staniford tracked down the specific details (reproduced in the table above) behind the proposed increases in Iraqi production. All but 200,000 b/d of the increase was supposed to come from southern and central Iraq, away from the areas now controlled by ISIS. 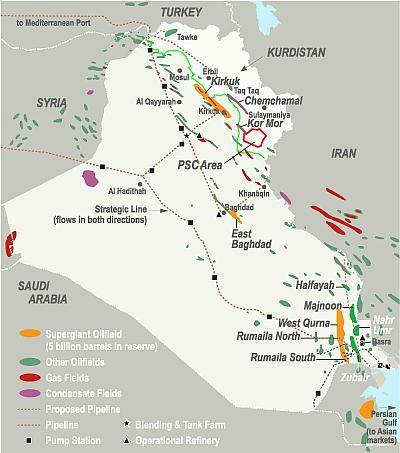 Iraq’s major oil fields. Source: Energy-pedia. Oil fields targeted for big production increases in second auction. Source: Petroleum World. Paradoxically, the unrest may help increase exports from the oil-rich northern Iraqi region of Kurdistan. The Kurdish government has recently opened a pipeline directly linking oil fields in the enclave to Turkey, raising the possibility of substantial exports in the range of 400,000 barrels a day of Kurdish oil though Turkey. 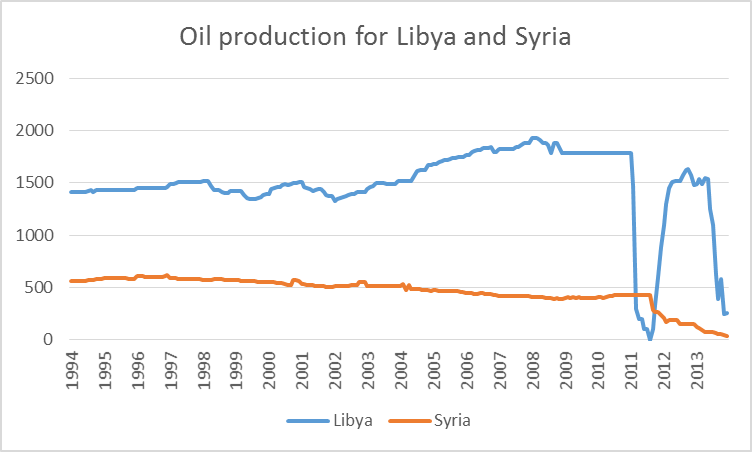 Although the consequences for Iraqi oil production of what has happened so far appear to be minimal, all this comes at a time when the earlier and still ongoing conflicts in Libya and Syria have already disrupted nearly 2 mb/d in world oil production. If Iraq’s recent 3 mb/d was also taken out, we would be talking about a significant disruption in world oil supplies, and likely an oil price in excess of $150 a barrel. How vulnerable would the U.S. economy be to another oil price spike? One of the mechanisms by which earlier oil shocks contributed to economic downturns was a sudden change in the composition of spending, as consumers for example stopped buying the less fuel-efficient vehicles that were historically central for North American car company profits. 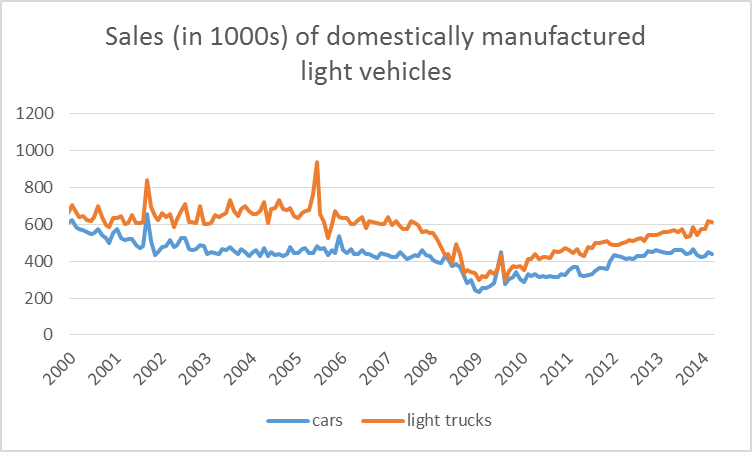 Sales of light trucks and SUVs manufactured in North America fell to the same numbers as cars during the Great Recession, but have since climbed back up to their pre-recession levels. Retail sales of domestically manufactured cars and light trucks in thousands of units, seasonally adjusted. But even so, the new vehicles people are buying today are much more fuel-efficient than the ones sold in 2006, and both the manufacturers and prospective buyers were already paying a lot of attention to fuel economy well before the latest developments. Another oil price spike in today’s environment is unlikely to have the same shock potential for the U.S. auto industry as it did the first time gasoline prices went to $4.00 a gallon. 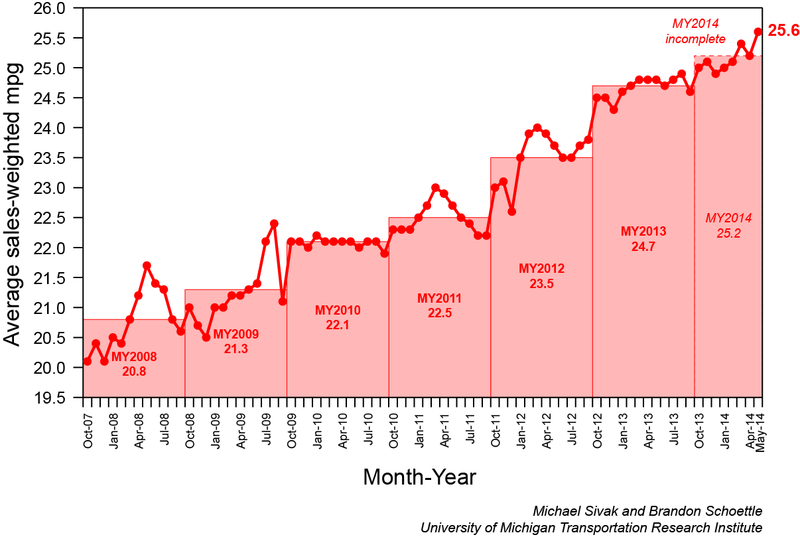 Average sales-weighted fuel-economy rating (window sticker) of purchased new vehicles. Source: University of Michigan Transportation Research Institute. North Sea Brent crude oil closed Friday at $113/barrel and West Texas Intermediate at $107. That’s up sharply for the week, but still below the highs of $125 and $110, respectively, that we’ve seen since 2011. Price of Brent, dollars per barrel. Source: EIA. The average U.S. retail price of gasoline is still 30 cents a gallon below recent highs as well. A modest move back up seems unlikely to shock consumers into different patterns of spending than they had already been planning. Energy expenditures overall are back down to about 5-1/2 percent of the average household’s budget. Energy expenditures as a percentage of consumer spending, 1959:M1 to 2014:M4. Calculated as 100 times nominal monthly consumption expenditures on energy goods and services divided by total personal consumption expenditures. Data source: BEA Table 2.4.5U. Blue line is drawn at 6.0%. To summarize, my view is that the U.S. economy is less vulnerable to an oil price shock than we were in 2007. Moreover what has happened on the ground so far in Iraq should not have major immediate implications for the price of oil. Analysts say the financial and strategic spoils of ISIS’s capture of Mosul and Tikrit could provide a significant, nearly unstoppable boon to its Syrian arm, helping turn the tide in the months-long battle for Deir Ezzor. So the immediate implications for the U.S. economy may turn out to be minor. After that? The world seems to be changing. One Response to "Iraq, Oil Markets and the U.S. Economy"
this is the type of tripe that ruins an otherwise serious attempt at being serious. this "force" is not to be taken seriously…and indeed way have showed their hand in such a way that the counter thrust will be far more devastating. it's easy to play to your own petty emotional beliefs…that somehow "this is a one shot deal" and "finally, the Vietcong have won!" but these folks who came from "nowhere" (no doubt sponsored by folks in the West and Riyadh) can just as easily "go back to nowhere." 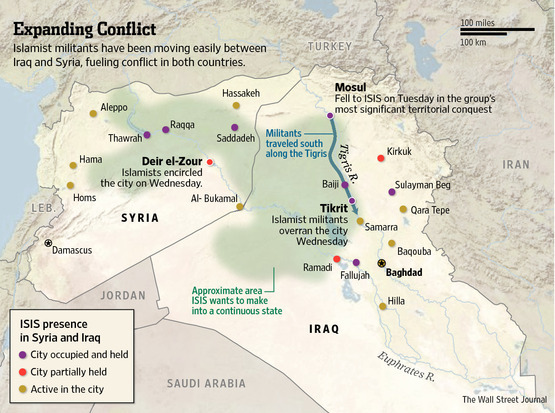 The amount of force the Iraqi central government can bring to bear here is quite substantial. This could be a kick off to a second Iraq/Saudi war as well. That would have a highly dramatic impact on prices as "each one would have to out produce the other to finance it." I think the President gives good advice when he says "all sides should try and work together." Clearly however folks on the ground don't see it that way.